CEO and “hairnista” Jaeda James’ love affair with hair started fifteen years ago. As a young woman who loves to change her hair constantly, Jaeda knew that many other women like having the same options. Jaeda began experimenting with wigs and extensions as a way to create new looks. When purchasing her extensions she often found that the quality of the hair was of low-quality and the customer service where she purchased her extensions from was often hit or miss. Jaeda would often say to family and friends that she should open her own hair company because she knew that she could do a better job - offering premium quality hair and outstanding customer service. As a little girl growing up Jaeda has always loved the color pink and her favorite childhood game was playing Princess with her friends. She shared that if she had her own company it would be called, “Princess Hair Shop.” Although Jaeda was still working her stable and secure corporate job during the day she always had a burning desire to start her own business. After talking with her husband and business partner Lenny, they decided it was time for her to take the leap and pursue her dream of starting her hair company. Although skeptical her husband thought that Princess Hair Shop would be a hobby for his wife. After seeing the amount of work that she put into her dream, working her day job while working Princess Hair Shop at night, he started to see her business quickly gain momentum. 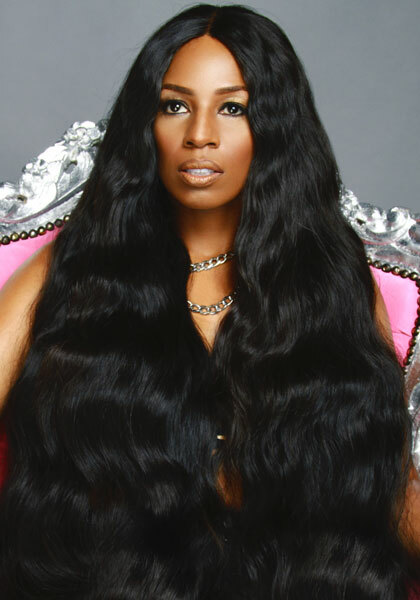 Jaeda’s success and respect as a highly regarded hair company is illustrated by the quick-rise of her line of wefted hair and clip-in hair extensions. Princess Hair Shop was created by Jaeda and inspired by her childhood belief that, “Everyone should feel like a Princess.” Launched in Fall 2011, to surprising success and great response, Princess Hair Shop now has customers around the world. For Jaeda, looking glam isn’t just for Hollywood celebrities. Every woman deserves to feel and look like a “Princess” on the outside and inside. Jaeda made it her mission to ensure that by offering great quality hair the Princess Hair Shop customer is able to have her hair cut, colored and styled to re-create any look desired. Her goal is to empower women everywhere to celebrate what makes them unique, through their hair color or style. Princess Hair Shop hair is one of the most sought after hair lines that professional hair stylists and Hollywood celebrity hair stylists use. Because a woman’s style is ever-evolving, Jaeda understands the importance of staying up-to-date on the latest hair trends and styles. Princess Hair Shop is the first to launch new trends in hair textures to their customers. Princess Hair Shop has over 10 textures in a variety of colors that customers can select. Jaeda understands that a woman’s hair is considered her “crowning glory” and the condition of a woman’s hair has an impact on their self-confidence. That is what originally inspired and empowered her to create Princess Hair Shop, amassing over ten textures of hair and origins, designed to have a woman have “Hollywood Hair” or the everyday woman have style options. She also knows that customer feedback is very important and truly listens to her customers to ensure that Princess Hair Shop products are of high quality. Jaeda understands that hair is an accessory but for many women it is more than that; It is a major part of their style, fashion and positive self-image. Since founding Princess Hair Shop Jaeda has helped many women, which is her mission. Jaeda is a down-to-earth and humble individual who loves sharing, caring and supporting others. Princess Hair Shop enjoys being charitable and offering support to organizations that assist women who are experiencing hair loss because of medical conditions or chemotherapy. Jaeda is extremely passionate about men and women pursuing their dreams like she did and supporting her friends, family and colleagues in fulfilling their dreams. Jaeda doesn’t believe that people need to be competitive with each other, even if you’re offering the same products or services in business. She is a strong believer that collaborations are important and “What goes around, comes around – that is why she is supportive of her clients taking advantage of the opportunities that digital and social media affords us that were not available 15 years ago. As a busy wife, mother, hair maven and entrepreneur Jaeda is a firm believer and living proof that if you work hard, love what you do and follow your passion and dreams, that you can do it too!